Intuitively, I subscribe to Walter Cronkite’s view that libraries are a good thing. But after all the outrage about the impact of public sector cuts it came as a bit of a surprise that there are still some day centres for the homeless and unemployed aka public libraries left open here in Blighty. What brought this startling fact to my attention – frankly, I can’t remember the last time I went to a library – are figures, released by the Public Lending Right which manages payments to authors showing the top 100 books borrowed from libraries between July 2012 and June 2013. 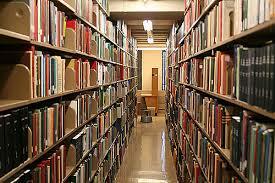 Authors get 6.20p each time a book is borrowed but their annual earnings are capped at £6,600 a book per annum. Regrettably, I have yet to get a cheque from the PLR but one day… mark my words! Lee Child with The Affair at number one with almost 80,000 borrowings and A Wanted Man occupies the top two places followed closely behind (I use the term advisedly) by the bane of British charity shops, Fifty Shades of Grey. Unusually the top three spots are occupied by British authors. James Patterson has fifteen books in the top 100 making him the UK’s most borrowed author and six of the top ten children’s books borrowed were penned by the Daisy Rainbow collective. However, the number one children’s book was Jeff Kinney’s Diary of a Wimpy Kid: The Last Straw. The most borrowed non-fiction book was the Hairy Bikers’ book, The Hairy Dieters: How to Love Food and Lose Weight, followed by Clare Balding’s My Animals and Other Family, showing the pernicious influence of television. With the exception of Hilary Mantel’s Bring Up the Bodies – does this qualify me for being a Yorkshireman – I can’t say I have read any of the titles featured in the listing. I’m not sure what that says about my taste. As I have long suspected, perhaps I’m just out of touch with real life. Author frimleybloggerPosted on February 28, 2014 February 28, 2014 Categories Culture, NewsTags Lee Child, Public Lending Right, Top library books borrowed in 2012-13, Walter CronkiteLeave a comment on Whatever The Cost Of Our Libraries, The Price Is Cheap Compared To That Of An Ignorant Nation. What Is The Origin Of? (44)…. The recently crowned CAMRA pub of the year for 2014 boasts this sobriquet but what does it mean and what is the origin of the phrase? To start with there are two variants of the name, the one stated above and the Swan with two nicks. No less an authority than Sir Joseph Banks, the naturalist who accompanied Captain Cook on his first voyage down under (1768 – 1771), declared at a meeting of the Antiquarian Society in 1810 that the nicks variant was likely to be the origin of the phrase. The nicks refer to the scratches made on the beaks of swans during the ceremony known as Swan Upping. Traditionally, the British king or queen has right of ownership of all unmarked mute swans to be found on open water. However, they only assert ownership rights on certain stretches of the River Thames and its surrounding tributaries, although recently this has equated to half of England! These rights date back to the 12th century when swan was a favourite form of tucker for the royals. Under a Royal Charter issued during the 15th century two Livery Companies from the city of London, the Vintners’ Company and the Dyers’ Company also were entitled to share the monarch’s rights. The ceremony of Swan Upping takes place annually during the third week of July. During the ceremony representatives of the Queen, the Vintners’ and the Dyers’ (the uppers) row up and down the river in skiffs. Those swans which are caught by the Queen’s Uppers are left unmarked, save for a ring linked to the British Trust for Ornithology’s database. Those caught by the Uppers of the Livery Companies are given a second ring, affixed to the other leg. In days of yore the Uppers marked the birds by scratching their beaks, hence the two nicks. These days, only swans with cygnets are caught and ringed – the process gives invaluable scientific data about how well the birds are breeding – and they no longer grace the dinner table of our betters. In 2009, the Queen, as Seigneur of the Swans, actually troubled her arse to watch the ceremony, the first monarch to do so for centuries. Doubtless, the ceremony lost its appeal when you could no longer identify the bird you wanted to eat. Author frimleybloggerPosted on February 27, 2014 February 27, 2014 Categories Culture, HistoryTags Dyers' Company, Sir Joseph Banks, Swan Upping, Swan With Two Necks, Vintners' CompanyLeave a comment on What Is The Origin Of? (44)…. Shock waves have travelled around the world at the treatment meted out to Marius the giraffe who was shot at Copenhagen zoo and whose carcass was publicly dissected and then fed to the lions. His crime – his genes were too common to be of use for breeding, a charge that could be levied against many of us, methinks. Soon afterwards, news emerged that another Danish giraffe, also called Marius – you can see what compounded the original Marius’ problems; not only were his genes too common so was his moniker – resident of Jyllands Park zoo was also up for the chop for the same reason. Seems the Danes are very picky! If you think Marius’ fate was outrageous, consider the fate that befell an elephant called Topsy. The unfortunate pachyderm belonged to the Forepaugh Circus (great name) but had spent the last few years of her life at the turn of the twentieth century at Luna Park in New York’s Coney Island. Topsy had a bit of a temper on her – she had killed one of her keepers who had burned her trunk with a lit cigar (who wouldn’t react negatively to such treatment?) and had become aggressive to two other keepers who had struck her with a pitchfork. The zoo authorities decided that for such offences against humankind, she would have to go but how to achieve it? The initial suggestion that she should be hung. Leaving aside the engineering feats that would have had to be performed to achieve the animal’s demise, this option was ruled out as being too cruel. The next suggestion was that she should be electrocuted. At this point, Thomas Edison, the famous inventor, stepped forward. He had been waging a campaign against Westinghouse’s alternating current standard for distributing electricity – he had developed the direct current method as a standard – by demonstrating how unsafe and dangerous it was. Edison tried to illustrate his point by zapping a few dogs and cats, cattle and horses, but he was looking for a big stage event. Electrocuting an elephant was just too good an opportunity to miss. So on January 4th 1903, in front of a crowd of 1,500 bystanders, Topsy was fed carrots laced with 460 grams of potassium cyanide before having a current of 6,600 volt AC sourced electricity passed through her body. The animal was seen to topple to the ground and to move for a few seconds, smoke billowing from her feet, before she met her maker. 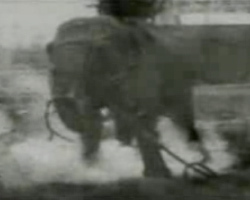 The whole gruesome event was filmed – you can find it on YouTube if you are so minded – and the result, Electrocuting an Elephant, was seen by audiences throughout the States. Despite a trail of dead animals Edison’s campaign failed and AC, having demonstrated its superiority in less lethal ways, became the standard for electrical currents. Truly, man’s inhumanity to animals knows no bounds. It comes as a shock to us self-obsessed Southerners that not only is there life out there beyond the metropolis but also that there are charms to be found which are superior to anything we can find. 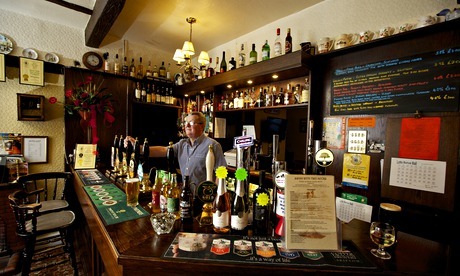 For the second year in succession the Campaign for Real Ale has awarded its prestigious Pub of the Year award to a boozer in Lancashire. 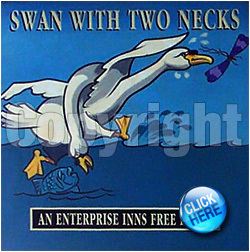 Following on from The Baum in Rochdale, the winner this year is the delightfully named Swan with Two Necks which is to be found in the Lancashire village of Pendleton, close to the town of Clitheroe. You may have heard of Pendleton because of its association with witches, prompted, mainly, by William Ainsworth’s 1849 blockbuster, The Pendle Witches. The pub beat around 57,000 other establishments to secure the crown and, in particular, the other short-listed pubs – The Hope in Carshalton, The Horse and Jockey in Stapleford and The Old Spot Inn in Dursley. According to the judges, what won it the crown was its excellent range of locally brewed beers, its well-priced home cooked grub and its strong role at the heart of the community. Until 2002 it doubled as the local post office, saving local pensioners the trouble of expending unnecessary energy by shortening their journey to spend their weekly stipend. The food is served in portions ideal for the hungry walker ie massive and for the summer months or for those who enjoy ingesting nicotine with their pint there is a garden and seating outside the front of the pub, overlooking the village and a small stream. Naturally, there is a roaring fire to greet topers in the winter. If you are looking to catch up with a major sporting event, you are out of luck. There is no TV here. Sounds idyllic. Of course, coming to national prominence is a double-edges sword for oases of tranquillity such as these. They run the risk of being descended upon by tourists keen to tick off another pub from their list. Temporarily good news for the publican, Steve Dilworth who has run the establishment for 27 years, but irksome for the locals. Still, it will soon pass. Camra is to be commended in not only helping to boost the wide range of ales available in Blighty but in helping to bring attention to and preserve good traditional boozers like this from the ever-present menacing threat of factory pubs a la Wetherspoons or, God forbid, Irish theme bars. 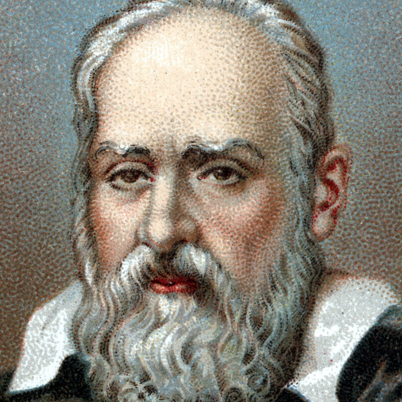 It is a truth universally acknowledged that Galileo was a bit of a clever geezer and what troubled him should rightly concern us. Of course, he compounded his problems by developing the telescope so he opened his senses up to things that had never troubled Homo sapiens before. One thing that kept him awake at night, apart from wondering when the Inquisition would next pop up, was why the planet Venus appeared bigger than Jupiter to the naked eye but when viewed through a telescope the reverse was true. I assume he was holding the telescope the right way round at the time. Seemingly, this is a problem that has baffled scientists for more than 400 years. But no more. When viewed directly with the naked eye Venus appears to have a radiant crown which makes it look eight to ten times bigger than Jupiter, even though Jupiter is four times larger when seen from planet Earth. Galileo thought that this radiant crown was something to do with what he called an impediment of our eyes which was eliminated when we use a telescope. He thought the phenomenon was due to optical interference to the light of the planets as it entered our eyes. Researchers, led by Jens Kremkov at the State University of New York College of Optometry – the results were published in the Proceedings of the National Academy of Science – have shed new light on to the problem. The effect, it seems, is down to the way the light-sensitive cells at the back of the eye respond to images of different intensity set against a dark background. The light coming from Venus is brighter than that from Jupiter and the retina and brain are finely tuned to respond to the contrast between light objects against a dark background. The brighter light of the smaller plant makes it seem larger than the duller larger planet. To test their theory the scientists used electrodes to record the electrical signals from neurons in the visual areas of anaesthetised cats, monkeys and human brains whilst the animals and humans were shown dark shapes on a light background, light shapes on a dark background and light and dark shapes on a grey background. 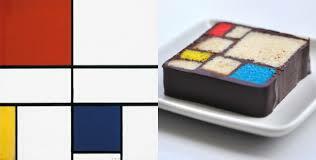 They found that white spots on a black background looked bigger than same-sized black spots on a white background. The source of Galileo’s problem is the way neurons are laid out and inter-connected in the retina and brain and, the researchers surmise, it has ever been thus since the development of sight in the photoreceptors of the eye. The explanation to Galileo’s problem also helps explain why we are more comfortable reading black print on white than white text on black – a fact that users of more adventurous blog templates would do well to remember. As a regular habitué of art galleries, I must confess I am left feeling bewildered when I come across a piece of modern art. Am I to take it seriously or is the artist just taking the piss? I was glad to discover this week that I am not the only one who can often fail to appreciate a piece of art for what it is. A cleaning lady in southern Italy threw away what she thought was some rubbish left behind by workmen who had been setting up an exhibition in Bari. It turns out that one of heaps of rubbish – cookies scattered across the floor in what was termed an artistic arrangement – wasn’t rubbish at all but a major feature of the exhibition. Silly woman! The works were valued at €10,000 and her employers are having to make a claim on their insurance. I blame the artists, myself. They should put their works in a tidy frame and hang them on the wall like all self-respecting Old Masters. It was heart-warming to see the Government take matters seriously once the flood waters penetrated the Home Counties. Blogger Towers has, mercifully, escaped the inundation but Egham, which is just down the road, has taken a hit. Too much attention has been focused on the plight of residents and their property when the real story – the plight of pets – has largely gone unreported. To redress the balance I bring you news of the derring-do of Egham resident, Dave Pope. As he was wading down a tributary of the River Thames aka Egham High Street his attention was caught by a flash of gold in the waters below. 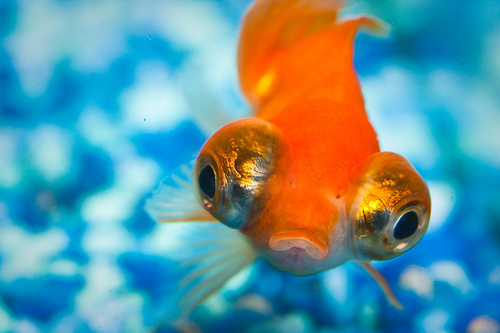 Showing the quickness of thought that epitomises the Englishman and won us an Empire he did what any of us would have done – grabbed the nearest teapot and scooped up what turned out to be three goldfish. Once Noah has retreated to Mount Ararat I must take a walk down Egham High Street and discover where this stash of teapots is kept. You can never be too prepared!